The traditional Survivor Series elimination match between Raw vs SmackDown started amidst much fanfare. While the likes of Shane McMahon and Samoa Joe headlined the Blue brand, Raw was powered by Strowman and McIntyre. However, for those expecting the match to go down to the wire, it turned out to be a bit of an anti-climax. Raw won comfortably as they dispatched their opponents with three of their members surviving. While the overwhelmingly easy victory for the Red brand raised a few eyebrows, the WWE pulled a rabbit out of the hat when they displayed Strowman as the dominant figure. After Samoa Joe was eliminated by McIntyre, Strowman took it upon himself to single-handedly decimate SmackDown. The Monster Among Men eliminated four of the Blue brand’s finest with Shane McMahon becoming his last victim. Recently, Strowman went head to head with Lesnar and the match ended with the latter trouncing the former to lay his hands on the ultimate prize. 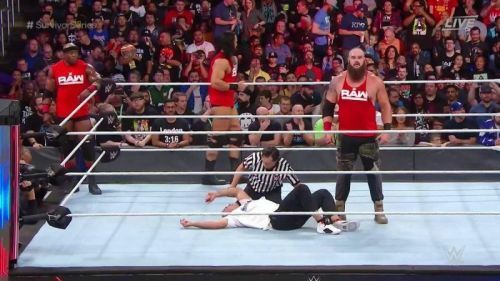 Looking at Strowman, you get the feeling that he is still seething from that mauling. Thus, by displaying him as the dominant figure, the WWE has built up a head of steam, a head of steam which could help him exact revenge on the Universal Champion, Lesnar. While critics would always question the WWE’s decision to throw up such a one-sided contest, they surely can’t argue with their decision of getting Strowman to eliminate four rival team members. Though other debates regarding the show might go deep into the night, this is one decision the WWE got absolutely right.